Head to historic North Carolina where a brooch unites the lives and loves of four women. Dangerous accusations force Seona to leave Scotland with the brooch in tow, but will she find peace before her past is revealed? Years later, Fiona hopes to recover the brooch only to wind up on the whipping block. Can she trust the man who comes to her rescue? Seren sells the brooch to open a confectionery, but will the precious heirloom be lost to a hopeless dream? 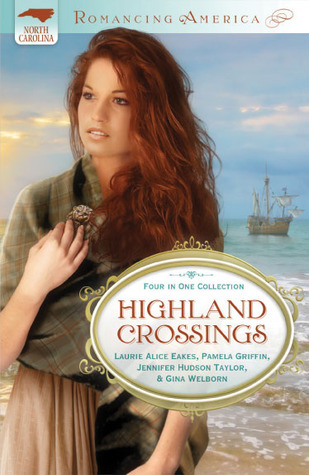 When the brooch is stolen, can Brynna reclaim it before she lose something even more valuable? I love historical fiction. If you can wrap romance up in it, all the better. Highland Crossings is actually 4 stories that follows a brooch through four different generations from Scotland to America. The brooch ties all three stories together nicely. In “Healer of My Heart” Serena is accused of being a thief. She sneaks aboard the Thistle, a ship headed for America. She is caught by Colin Campbell who recognizes her healing abilities. He saves her because she uses her skills to help a family member. When they reach North Carolina his cousin Isabel welcomes her. Although she and Colin are attracted to each other, can she trust him with not only her life but her heart? In “Printed on My Heart” we meet Seona’s cousin Fiona. She finds herself being punished for being unemployed. In my opinion, whipping someone for not having a job was absolutely sadistic. She was rescued by Owain. She becomes their indentured servant. She begins to find love with Owain and with God. In “Sugarplum Hearts” Seren Cardew has come to possess the brooch. She sells it to open a candy shop. Finley Sinclair thinks he is God’s gift to women. He wants a simple life and he wants it with Seren. He proposes a deal with her to promote her confectioneries and benefit himself. First he has to win over Seren who doesn’t see him as God’s gift to women. The last story “Hearts Inheritance” we find Brynna Sinclair, lover of all things historical. She wants to open a museum. Her sister is currently in possession of the brooch. It doesn’t seem fair since she is the one who loves history. Enter Niall Cameron who has received an inheritance from his uncle. When his plans clash with Brynna’s, a woman he is falling for he decides he must find a way to get on her good side. When the brooch is stolen, he decides this might be the opportunity he was looking for. All four of these stories were wonderfully told. They carry with them lessons of healing, trust, love, relationships with people and God. I had not read anything by any of these authors before this book. It was a wonderful way to be introduced to four wonderful authors. This book along with others they have written are a must read. Thank you for your kind words on our stories. We had a great deal of fun creating and writing this series. Pamela, Jennifer, and I have several books out. This was Gina's debut, and certainlywon't be her last. Oh, absolutely, Sandra, thank you for the kind words! I'm thrilled to hear you enjoyed our collection. I look forward to reading more of your works and reviewing them. I must pass this book on to my mother to read. I know she will enjoy it as well. Thank you, Sandra! I'm so happy to know you enjoyed our stories. :) We sure had a lot of fun creating them.